I love the color orange. Where some see brash and loud, I see bright and ALIVE. So it's with particular interest that I study the strangely orange snack foods of the world. These tasty foods appear almost fluorescent in their orangeness, and I think we are indeed lucky to live in the same world where snacks are so bold! 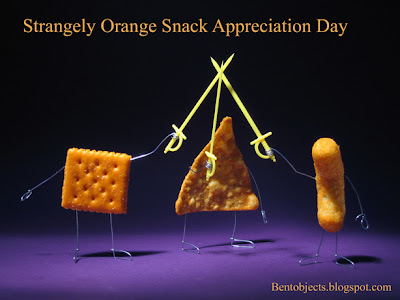 These snacks deserve their own day of celebration as far as I'm concerned! Perhaps a day of eating and drinking only orange foods and orange beverages! Join with me now, and let us plan just such a day! Hoo-rah for orangeness-ness! Edit- I wasn't thinking today would be the day to celebrate orange food, although rereading my post that's how it might seem. I was thinking more in the near future, after a little planning. I've now decided that I'm going to choose one day soon to eat nothing but orange food and drink orange beverages.